It’s been 16 years since we started the adventure of travelling to Turkey, buying there our Turkish schooner and sailing back to the south of Spain. We crossed the Mediterranean and made our dreams come true. 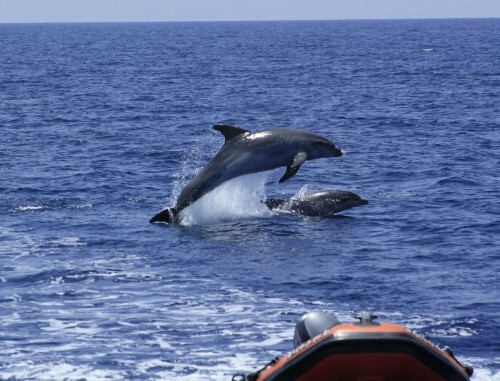 It’s been 16 years since we started to sail the sea in search of dolphins. It’s been 16 years since that first party and inaugural route with our first 10 guests aboard. 16 years where the Karyam, the marine life and all guests have been part of our lifestyle. A different but wonderful lifestyle. Throughout this time, we have travelled enough miles to circle the world, sailing our very own world of waves, dolphins, pilot whale herds and lonely sea turtles. Miles and miles left behind accompanied by seabirds, breezes and winds. We can only say a warm “thank you” to all those who have made possible these 16 years. 1º Each single guest who has embarked all over these years – we would not be here without you. 2º The sea and its wildlife. Without them, too, we would be nothing. 3º Our ship Karyam, who has a seafaring soul and has always brought us back home safely. And our ship Osprey II, who is also becoming a true sea dog.